When it comes to phosphorus management, there are two schools of thought: 1) the sufficiency approach, which is designed to maximize economic return for each dollar of P fertilizer applied; and 2) the build and maintain approach, which seeks to mitigate risk by keeping soil test P at a level that minimizes the potential for yield loss. 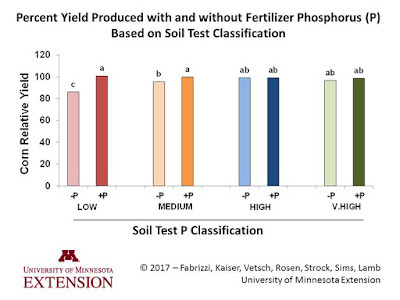 In 2011, University of Minnesota, with funding provided by the Agricultural Fertilizer Research and Education Council (AFREC), set out to test these phosphorus management strategies in long-term replicated field experiments. Six experiments were established across Minnesota in Olmsted, Polk, Redwood, Sherburne, Stevens and Waseca counties representing various soil types with differing parent materials. In Phase I, researchers applied 0, 30-40, 50-70 and 100-120 lbs P205 per acre in each of four years (2011-2014) to develop four categories of soil test P, classified as low, medium, high and very high as defined for Minnesota. 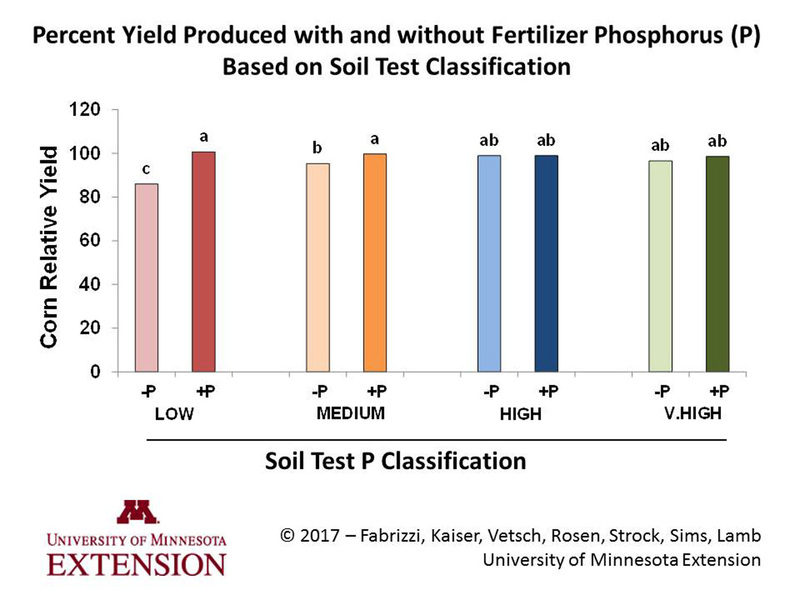 In Phase II, researchers examined maximum corn yield potential of the four soil test P classes after fertilization with P at 150% of the current suggested rates for corn in Minnesota. Across sites, corn grain yield responded to applied fertilizer P in the low and medium STP classes only. There was no grain yield response to applied P on high or very high STP classes. Additionally, there was no difference among the STP classes in maximum grain yield. These results revealed no risk of yield loss with the sufficiency approach using sufficient applications of fertilizer P based on soil test P, even on Low testing soils, level s compared to a building and maintaining high testing P soils. Use the soil test as a tool to gauge the risk of nutrient deficiencies in the soil. Know where the soil needs nutrients so you can put the fertilizer where it’s needed. Trust that the soil test will provide accurate information on where your best chance will be for a return on investment. Once you reach an optimum level, it doesn’t pay to be overly aggressive with fertilizer P management. Focus on other management investments what will bring a better return on investment. For more information, visit U of M Nutrient management website. Support for this project was provided in part by the Agricultural Fertilizer Research & Education Council. can you address the additional P and even K applied for next years soybeans? is this as good as applying the P and K in the year of the soybeans? Trying to avoid application cost each year! fertilizer plants are now saying to keep adding additional P and K every year!? The answer depends on the soil type. The only time I have seen a benefit from application before the soybean crop is a situation with high carbonates 5-10% or greater. I am thinking of following this post up with another related to your question as we have looked at application in a 2-year corn-soybean rotation and it really does not seem to matter when the fertilizer is applied as long as the rate applied for the two cropping years is correct. To answer your question you should be able to apply all the P before corn and be okay. The study outlined in the post above is being run in 2017 where we will actually have P rates applied to low test fields in only before the 2015 corn or the 2016 corn but nothing for soybean. Hopefully we will have a follow up post this fall. For K carbonates do not matter. Timing isn't important but rate over the two years is. Based on the data for most soils I would put on the P and K ahead of the corn crop. Will soils with a higher level of biological activity from several years of strip till and cover crops produce higher yields on lower P soil test levels because of microbial mineraization of native soil fertility? I feel like we have seen this on our farm. Building soil P levels is a slow and expensive process. It depends on how low you are talking. Phosphorus is released in the decomposition of organic matter. Typically the probability that added phosphorus will increase yield is fairly constant for a particular soil test class particularly for low and very low soil test values. It would be possible for greater availability with higher biological activity but the research in that area is just picking up. My P levels run from 6-8 (Olsen test). In SW MN we have been growing 200 bpa+ corn and 60 bpa+ soybeans the past few years. The question is: Will increasing my P levels enhance or detract from my bottom line??? At 6 ppm you have more options as the rate suggested should build the soil slowly unless you have high P fixing soils. We had a study at Morris and Lamberton which started with similar starting soil test values and were able to see a small increase in soil P when applying around a removal rate for each crop. The benefit you have is that you should be able to at least return the cost of P in crop value if not more than the cost of the P. If you get beyond 10 ppm olsen then they you may not see much of a return from anything but in-furrow starter.